To manage your client’s Sender name click on “Re-seller” on the main menu. Select "Sender Name” from the drop box menu. Fill in the boxes with clients information to search for a specific client or scroll from the table of entries. To add a new sender name for a client, click on “Add New Sender ID” button. Then click on "submit button"
Sub-account sender ID requests are visible under the ‘Manager Sender Names’ view. New sender IDs can also be added/requested manually. These sender Names still need to be approved under the main Re-seller account. 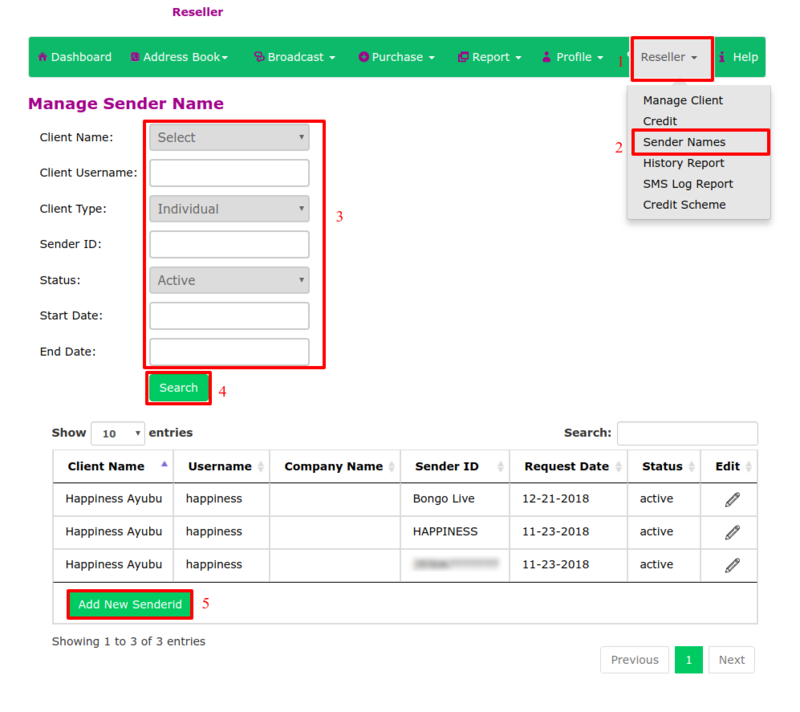 To request of a new sender name for your client, fill the boxes with the new sender name. You will receive a notification that “Request for sender name submitted successfully” as shown below. The sender name will need to be approved at mobile operators by our team under the Re-seller’s main account. Thus the sender names will need to be submitted under the main Re-seller account for Bongo Live to process them.